I extend a cordial welcome to you and, through you, I wish to extend my greetings to all Christians in Pakistan, especially those who live in the most difficult situations. I thank Mr. Paul Bhatti for his speech. I pay tribute to the memory of my dear brother Shahbaz, and I am delighted to know that today he is loved and esteemed by many in Pakistan and that his sacrifice is bearing fruits of hope. The word of Jesus is also valid for him: "If the grain of wheat, fallen on the ground, does not die, it remains alone; if it dies, it produces much fruit "(Jn 12,24). Fruit of dialogue, understanding, reconciliation; fruit of fortitude, of courage, of meekness. And one of the fruits of the sufferings of Christians is the multiplication of groups and associations - like yours - that throw bridges of fraternity across the world, overcoming differences in language, culture and sometimes even in religion. Bridges of fraternity, first of all among the Churches and ecclesial communities themselves, which the Spirit animates more and more to walk together in service to peace and justice. Bridges of fraternity and dialogue with other believers, to foster relationships of respect and mutual trust. Your appeal to solidarity has found a prompt and generous response in Italy, especially in the Triveneto, involving Pastors and communities, and I am happy and grateful for this. I encourage you to go forward with this evangelical style that combines firmness and meekness, to assure the victims of false accusations and, at the same time, to realize concrete signs of the fight against poverty and modern slavery. I hope that, supported by prayer and by the active solidarity of many, you can extend your action in all areas of Pakistan where Christians and other minorities are more present and, unfortunately, also discriminated against and subjected to abuses and violence. May your hallmark always be the one that shines in the testimony of Shahbaz Bhatti and of many other martyrs of our time, namely the humble and courageous faith in the Lord Jesus and the ability to put love where there is hatred. This - we know - is not our work but of the Spirit, and therefore I ask the Virgin Mary to keep you always open and docile to the Paraclete. Thank you for the gift of this visit. 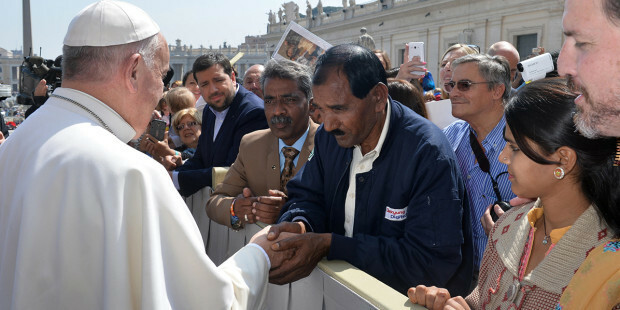 I accompany you with my prayer and my blessing, that I ask you to participate in the people you meet in your service in Pakistan, saying to them: "The Pope thinks of Pakistan". And I ask you to please pray for me.